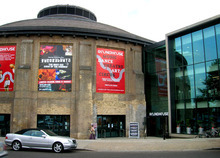 Run as a charity, the Roundhouse Trust hosts a bi-annual Circus Festival during the Easter Holidays and as such, has plans to erect a large Circus Tent in the adjacent car park in order to host this event. The tent will be open each night to a crowd of up to 200 people, in addition to performances taking place in the main Roundhouse building. To help with the planning and installation procedures, a full Underground Utility Mapping Survey was required to locate and map the whereabouts of all buried services and utilities on site. Following an initial site visit to the Roundhouse, Geotec Surveys were met by the Head of Operations and were able to identify the specific survey area, as well as the aims and requirements the client had in relation to the on-site survey and ultimate survey results. The survey site measured approximately 1,000 square metres and consisted of mostly tarmac car parking areas between the Roundhouse Building itself and a line of storage containers, located in the car park, adjacent to Regents Park Road. The Survey team were also asked to suitable amounts of topographical survey data so that we had sufficient information for the production of an AutoCAD base drawing, onto which the results from our underground mapping survey would be overlaid. Whilst on-site, our two man survey team utilised our well established methodology for a survey of this nature, employing a selection and combination of techniques including ground penetrating radar, cover lifting, threading, induction, use of radio-frequency detection (active and passive), sondes and dyes as well as using any available undertakers statutory records and local site knowledge, in conjunction with these physical detection activities. The service they received was of a high standard, with the whole process undertaken quickly and easily. Our on-site survey team established the presence of a range of power carrying features as well as various drainage ducts including surface water, and mapped these onto the topographical drawing produced and submitted to the Roundhouse Trust. The survey results were integral to the design process and indicated whether the Circus Tent could be erected in the car park at all, as it would be held in place using large stakes, hammered deep into the ground. Once the Roundhouse Trust and their design team had established that the Tent could indeed be erected in the proposed location, our survey results helped guide the team in establishing how big the tent could be and exactly how it could be installed.